Evaluation is an essential element of professional practice. However, there is little in the literature that is designed to help students involve and support young people in evaluating the impact of youth work activities. This comprehensive book explores current thinking about evaluation in the context of youth work and community work and offers both theoretical understanding and practical guidance for students, practitioners, organisational leaders and commissioners. Part 1 provides underpinning knowledge of the origins, purpose and functions of evaluation. It charts the developments in evaluation thinking over the past 50 years, and includes an exploration of `theory of change'. Concepts such as impact, impact measurement and shared measurement are critically examined to illustrate the political nature of evaluation. Findings from empirical research are used to illuminate the challenges of applying a quasi-experimental paradigm of evaluation of youth and community work. Part 2 introduces the reader to participatory evaluation and presents an overview of the histories, rationale and underpinning principles. Empowerment evaluation, collaborative evaluation and democratic evaluation are examined in detail, including practice examples. Transformative Evaluation, an approach specifically designed for youth and community work, is presented. Part 3 focuses on the `doing' of participatory evaluation and offers guidance to those new to participatory evaluation in youth and community work and a helpful check for those already engaging. It provides valuable information on planning, methods, data and data analysis and processes for sharing knowledge. This essential text will enable the reader to reconstruct evaluation as a tool for learning as well as a tool for judging value. 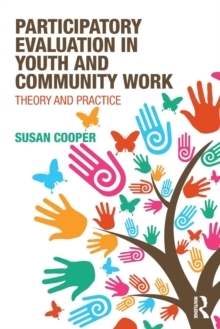 It provides a comprehensive reference, drawing on a wide range of literature and practice examples to support those involved in youth and community work to develop and implement participatory approaches to evaluating and communicating the meaning and value of youth and community work to a wider audience.